Jerry Wang (Guangsheng) Wang, a native of Tianjin, China. He has taught a Chinese traditional instrument - Erhu, at the Tianjin Conservatory of Music for over 25 years. Painting has always been his second passion. His art works have been published in the Tianjin Daily Newspaper and the Tianjin People’s Fine Arts Publishing House Magazine. He has presented his art works at Cleveland Ohio areas such as Lakewood Arts Festival, the Rocky River Art Show, the Hudson Public Library, The Cleveland Public library, and the John Carroll University. Mr. Wang collaborated with the Cleveland Classical Guitar Society. He also gave lectures and art demonstration classes at the Cleveland Institute of Art and the Cleveland State University.His passion for fine arts has passed onto his elder son, Tony Wang, he is now a well established artist and designer in Toronto, Canada. His design firm - TWdesignstudio.ca - specializes in interior design and 3D rendering for major companies in Toronto. 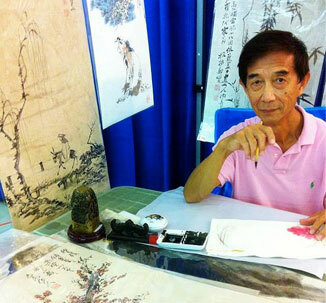 We are honored to have Mr. Jerry Wang to be our Chinese painting teacher this year. Click here to visit Mr. Jerry Wang's website.